If you are looking for an easy, crowd-pleasing, family-pleasing, kid-friendly freezer meal, then look no further! 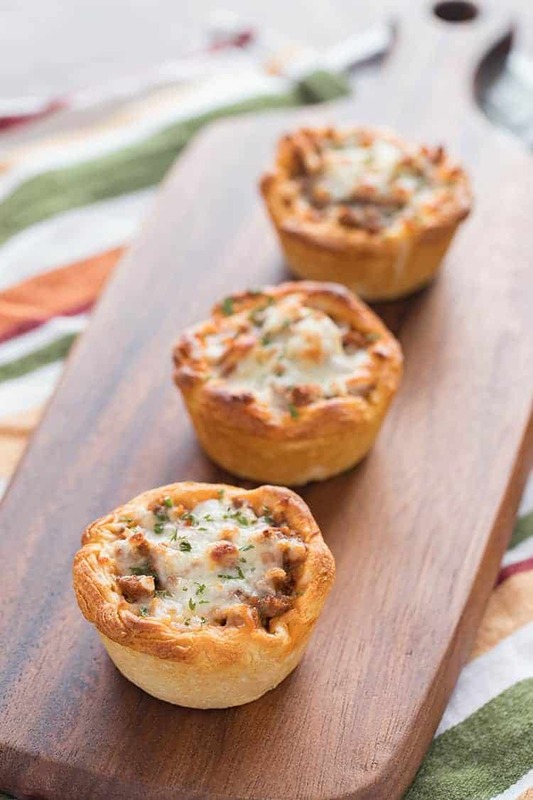 This Savory Italian Biscuit Cups freezer meal is easy to put together. I usually wait until the canned biscuits go on sale, then buy several tubes and make up several trays of biscuit cups to go in the freezer. 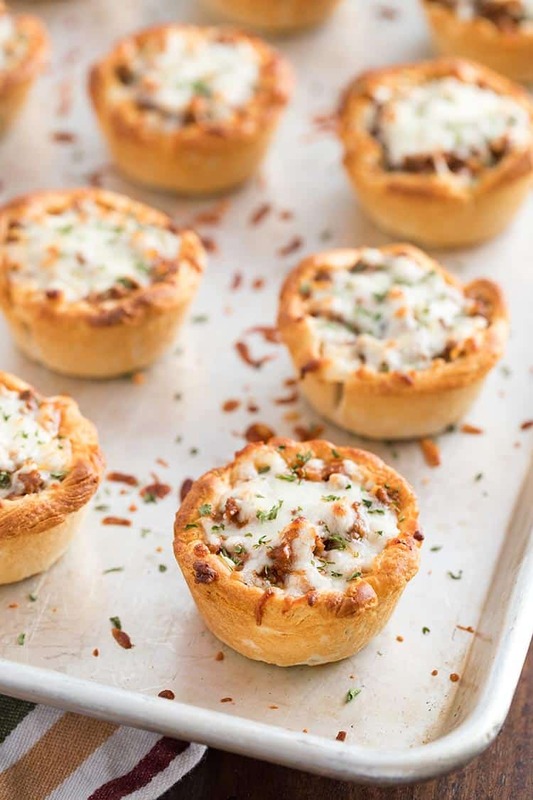 Biscuit cups work well as an entree for dinner, for snacks, or even for appetizers! They are also fabulous for lunches, too! Think graduation parties, summer barbecues, church potlucks – you name it! You can make these easily in advance as a freezer meal, and then finish them off just before you are ready to eat, with only a few minutes’ effort. And because they are individually portioned, they work well for small families (one or two people) or large families alike! You’re going to want to make sure you buy the “flaky” biscuit variety for these. I really recommend going with the Pillsbury Grands! brand. I know they are more expensive, but I haven’t had as good of luck with store varieties. The “flaky” part is important – it is what will allow you to split each biscuit easily into two thinner halves. To make the biscuit cups, you’re going to open your can of biscuits, separate them out, and then take each biscuit and pull it apart into two halves. You’ll notice there are lots of little layers in each biscuit – it doesn’t have to be perfect, just hold the biscuit in one hand, put your thumbnails about halfway up the side of the biscuit, and begin pulling the layers apart until you have a top half and a bottom half. Then take each biscuit half, and flatten into a circle about 4 or 5 inches in diameter. Press the dough circles into each cup of a prepared muffin tray and press into bottom and along sides. Then fill with your meat mixture and bake. 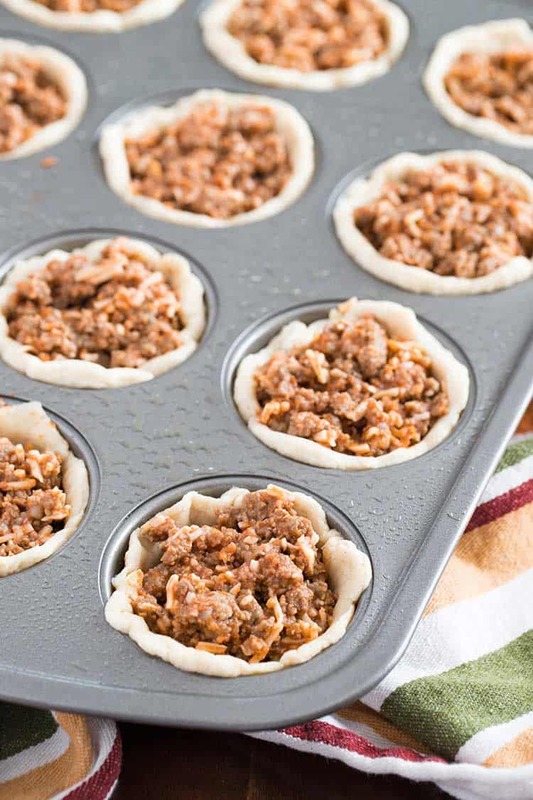 To freeze, allow biscuit cups to cool and then package for freezing. When you’re ready to make them to eat, let them thaw, arrange on a baking sheet, then top with additional mozzarella cheese and bake for 5-10 minutes until the cheese on top is melted and bubbly. Sprinkle with a little bit of dried parsley, or more Italian seasoning, and you’re good to go! You can also skip the freezing and instead make these up for immediate use. That works too, and I promise I won’t judge you for not turning this into a freezer meal. 😉 These work well for meal-prep and lunches even if you don’t do them as a freezer meal. They will hold for several days in the refrigerator, if they last that long! 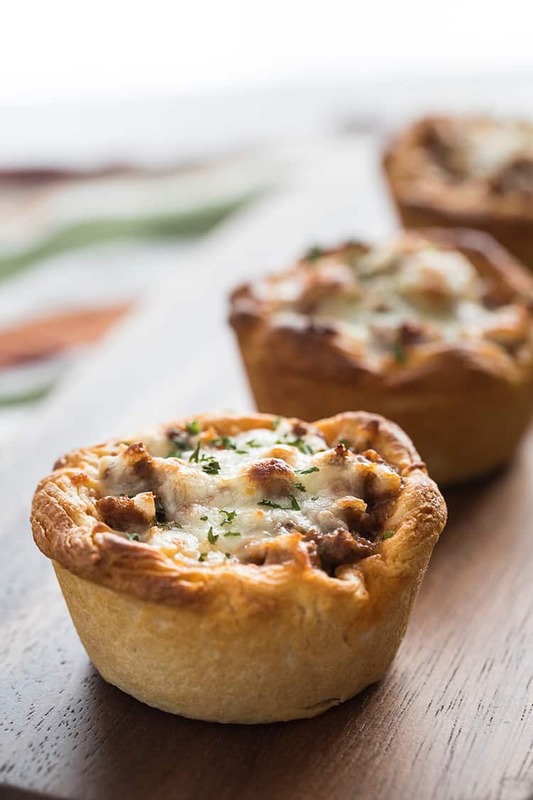 And if Italian isn’t quite your thing, I’ve got two other varieties coming up – Beefy Barbecue and Pepperoni Pizza Biscuit Cups!! Be sure to print the recipe and then pin it to your easy dinner or freezer meal Pinterest boards! A few simple ingredients come together for a delightfully easy entree - great for dinner, lunch, meal prep or parties! These are the perfect combination of savory flavors - think breadsticks dunked in meaty bolognese sause and then dipped in melted cheese! In skillet over medium heat, sautée onions in olive oil until translucent and soft (3-5 minutes). Add in ground beef, together with salt and garlic, and cook until beef is no longer pink; remove from heat and drain. Add in spaghetti sauce, Italian seasoning and Parmesan cheese and mix well. Spray muffin tins with non-stick cooking spray. Split each biscuit in half along the flaky layers (so there is a top half and a bottom half). Take each half and flatten into a circle approximately 4-5 inches in diameter. 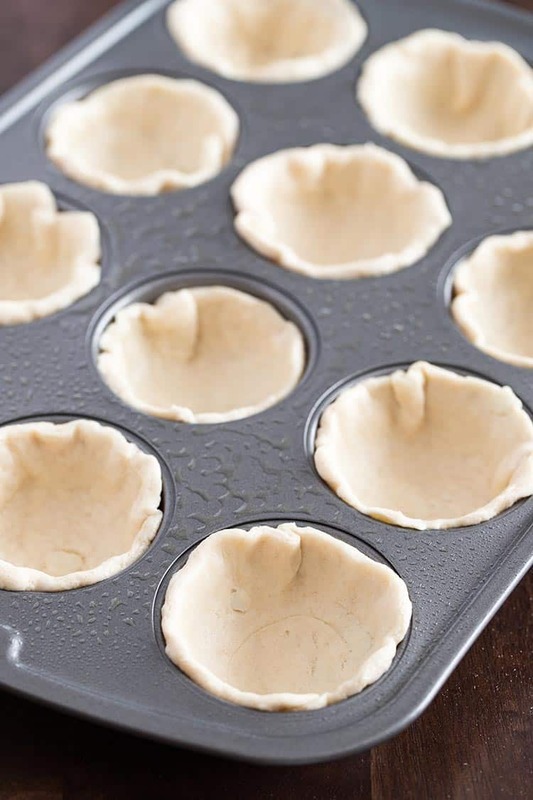 Press each circle into bottom and along sides of prepared muffin tin cups. Spoon 2-3 tablespoons of beef mixture into the center of each cup. Bake at 400 degrees Fahrenheit for 10 minutes. Remove from oven. 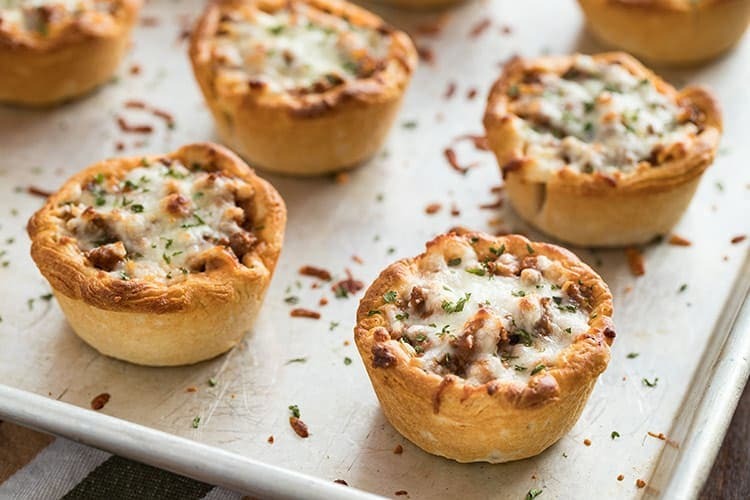 Cool baked cups to room temperature. Do not add shredded cheese. Place biscuit cups on baking sheet and place sheet in freezer for one hour or overnight. Then transfer biscuit cups to labeled freezer bag and return to freezer until needed. Preheat oven to 400 degrees Fahrenheit. Defrost biscuit cups overnight in refrigerator (or cook directly from frozen). 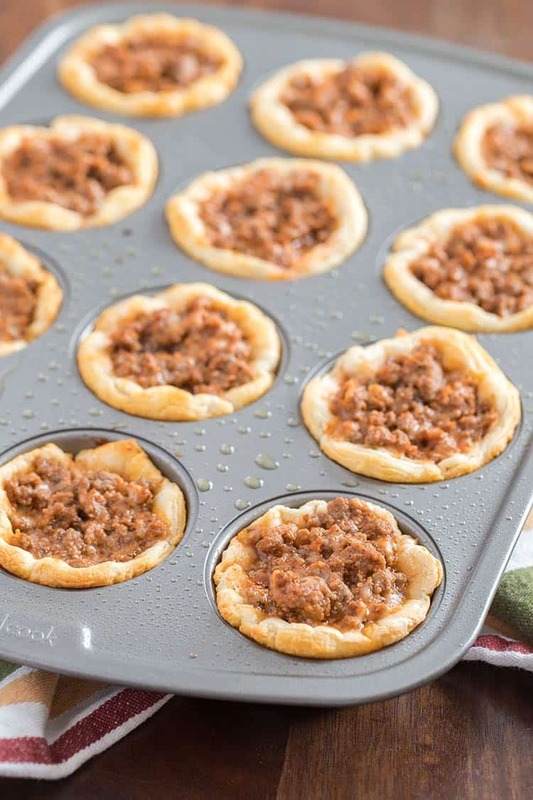 Place biscuit cups on baking sheet. Bake for 10-15 minutes (or longer if baking from frozen) until heated through. Remove from oven, sprinkle tops with shredded mozzarella cheese, and bake an additional 3-4 minutes until cheese is melted and bubbly. Serve. Yes, it will make 16 biscuit cups. They aren’t super big, so I figured a serving size of 2 biscuit per person was more realistic. So 16 biscuits, 2 per person, for 8 servings. I’ll go in and clarify that in the recipe card – I didn’t realize I had not stated that for the servings – oops! Thank you for pointing this out!